Today we talk about mystical levitation in the history of the Saints (many thanks to Joan Carroll Cruz and her book Mysteries, Marvels, and Miracles). What is it all about, who has had this gift, and what does it feel like? A listener in Lima, Peru, gives us some Spanish audiofeedback on St. Rose of Lima. In the e-mail segment we answer the question about why the Notre Dame University mascot is the Fighting Irish, and hear a suspiciously familiar-sounding theme song from an Australian Rules Football team, the Sydney Swans. Saints in the news include the miracle of St. Januarius, and news of a new possible miracle in Scotland. 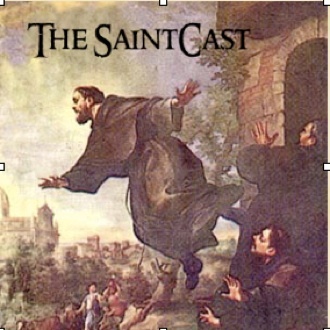 The first SaintCast produced with Ubercaster! We welcome your feedback on this new episode. Songs from this episode . . .